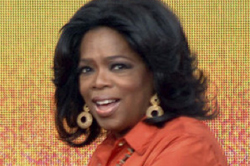 Oprah has received an invitation from Egypt’s new minister of tourism to do a show in Cairo’s Tahrir Square–the center of the recent Egyptian revolution. It’s part of an effort by the minister, Mounir Fakhry Abdel Nour, to boost tourism to the country. Nour also invited other celebrities to come to Egypt. Tahrir Square in particular is becoming a tourist destination, with several guided tours already set up for people to see the focal point of Egypt’s historic uprising. USA Today says that some American travel companies are resuming trips to Egypt in March (tourism has been down in the country following last month’s uprising). But there’s no word on whether Oprah will be there to greet them.